Light and crispy puffed hoops. Each 15g pack contains 303kJ/72kcal. Cooked with 100% sunflower oil. No MSG. No artificial flavours of colours. 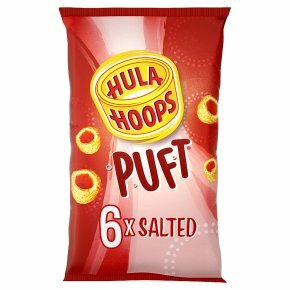 Suitable for vegetarians.Our Promise to You... Hula Hoops Puft are cooked with 100% sunflower oil and are completely free from all artificial flavours, colours and MSG. Of course they still taste great! Let yourself float away with Puft... The wonderfully light, crispy and ever so tasty, hoopy snack from the Hula Hoops family.